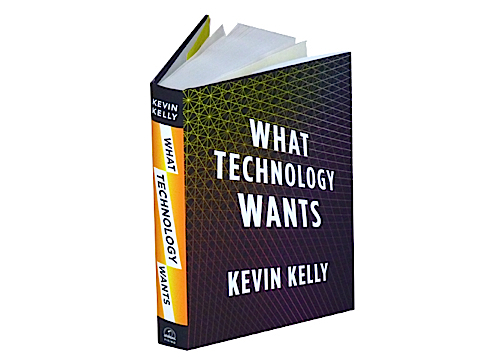 Today I received the first “hard” copy of my new book, What Technology Wants. The publishers, Viking/Penguin, did a brilliant job in producing this material artifact. The colors delight the eye. The cover is satin smooth, with glossy embossed title. Your hand wants to slide over it. It has a noticeable, but not overwhelming heft. It feels significant. The open volume beckons you to read it with crispy, legible type, arranged elegantly on the page. And there are plenty of pages, but not too many. The clean simple graphs float in clarity. The book even emits a mild, soft, welcoming smell of paper. Under the dust jacket I found a bold KK imprinted on the front cover — a touch the publishers didn’t tell me about. All in all, who would not want to spend many hours with such a device? The book’s theme is why particular technologies are inevitable and why we have a moral obligation to increase the amount of technology in the world. It is a summation and refinement of the hundreds of ideas I’ve posted here on the Technium in the past six years. I’ve cut out anything inessential and have added additional reasons and evidence into one long narrative argument — what we call a book. You too can own one of these remarkable reading gizmos. No batteries, ambient light screen, random access, containing the full text of my 120,000 word manifesto. You can now pre-order your copy here. (Don’t ask me why but you can’t preorder the Kindle version, although I have been assured it will be there when the book arrives on October 14th.) By pre-ordering you get the book at a steep discount and guaranteed delivery by the publication date. Be the first on your block to read how technology precedes humans and will also outlast us. Another reason to order this fine physical specimen: I suspect this will be the last paper-native book that I do. The amount of work required to process atoms into a sheaf of fibers and ink and then ship it to your house or the local bookstore is more than most of us are willing to pay anymore. And of course the extra time needed upfront to print and transport it is shocking. This book was finished, designed, proofed, and ready to be read four months ago. But atoms take time, while bits are instant. This week hard copies of What Technology Wants are being sent to reviewers, bloggers, and connectors. If you have an active following of readers and think you should get an advanced copy, email me. An immodest collection of early praise for the book can be found on the book’s web page. I hope it persuades you that it is worth reading. I don’t think anyone whos been reading your bits for more than a week needs any more persuasion to get this book. Kevin, I’m very excited about this book. But now I have a dilemma – I’ve just ordered a Kindle, so do I make this the first volume I load into it when it arrives, or go with physicality and order the print? Have really been looking forward to this coming out, congrats! I just ordered it on Amazon.de. I will review it on my blog http://www.shapingnetworksociety.com – it is read by the opengov crowd in the US, Mexico, and Europe. If you send me a pre-publication copy, I would review it as soon as I get it. Look forward to read all your thoughts in your book. This is a wish for book that I believe might be an eye opener to a lot of people. Congrats, I’m sure its a great feeling holding the printed book for the first time. I have followed the Technium blog for awhile now and am anxious to see what new thought and ideas you spark for me in this format. The opening pages “The Question” is a thing of beauty…Great writing–very provoking.